As the Reformer Martin Luther put it in 1518: All good things are hidden in the cross…for in Jesus Christ and Him crucified is righteousness attributed to us who believe… as well as…joy, hope, glory, strength! He died that we might be forgiven and rose that we might have eternal life! It was a real blessing to receive an e-mail from a Spanish-speaking man in Italy recently who told us that our radio programs are the only thing sustaining His walk with God since he has no church in his area (doing them in English and Spanish has helped us reach people we otherwise wouldn’t have). He explained that our teaching has really made him comprehend Jesus’ payment for his sins on the cross as well as the Lord’s grace and love to him in a way he never knew before. It is encouraging when we receive testimonies like this. Your prayers and support make it possible! Europe is a place of great spiritual need. That need often goes overlooked because when Americans go on a trip to Europe they may see big church buildings or cathedrals in many of the cities. However, what is not seen beyond the churches that are tourist attractions, is that many have been abandoned or are now used for other things. I remember walking down some non-touristed streets in the UK, and one after the other the old cathedrals had been closed, having been converted to business offices or shopping complexes, and there were those that have even become mosques. This is just an example of a place once impacted by the Gospel that needs it again. In fact, the BBC recently reported that less than 2 % of Brits attend church on Sunday now. While we may hear of pockets of activity here and there regarding the Lord reaching into people’s lives, the bigger overall picture shows a large mission field in need of being reached once again. The “Charlie Hebdo” attacks in France should serve as a wake up call that the spiritual vacuum in Europe is being sought to be filled by spiritual darkness of a very dire nature. Disillusioned with the empty promises of a purely materialistic Western culture that has abandoned its spiritual foundations, many are blindingly turning to something that is just another enslaving imposter. It is the Gospel of the Kingdom that must be brought forth in its fullness. We’ve seen those that are enslaved in spiritual darkness and emptiness get saved by Jesus’ great love and power, right in the thick of it, in some of the darkest places in Europe, as His power touched and filled their lives. We are preparing to leave on yet another Euro-mission where we will be preaching and ministering right off in some places in the north. We’ve had a little interim of time since our last venture there; however, we are always just seeking to follow the Lord’s timing and leading, thus not just going of our own accord, but following His leading. We truly appreciate your prayers and financial support, as traveling there is not anything even close to cheap. Even just the youth hostels are running up to $80 a night these days in some places. We stay with people where we can but that is not possible everywhere we go. Jesus said, go into all the world—Europe is a continent that has been largely overlooked in regards to mission—consequently, it is now in a dire spiritual state. The full Gospel must be brought forth there! 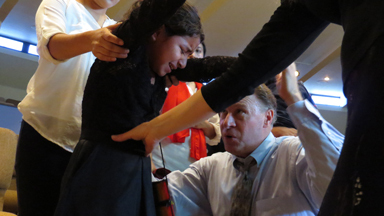 Young girl of about 11 who got filled with the Holy Spirit and was healed. We just ministered at a service up in Orange and were blessed to see the Lord moving in an incredible way. We preached and ministered on the need to be filled with the Holy Spirit as Paul exhorts in Ephesians, especially in the light of the warfare we encounter as believers—in fact, this is one of our weapons—to be filled with and pray in the Spirit. Well, the Lord confirmed that message as many were filled with the Holy Spirit and ministered to powerfully, as well as about three people who surrendered their hearts to the Lord that day. It was all highlighted by a little girl about 11 years old who was filled with the Holy Spirit for the first time, amongst a few other kids; she testified afterward before the congregation about what a joy it was to be filled with God’s power and love--she also shared how the Lord had healed her body--hallelujah! It was a joy to watch the tears steaming down her face with her hands lifted up in the air, her face lifted to heaven as God’s love poured down into her, to the point where, overwhelmed by His presence, she fell to the ground. It is such a divine moment when the Holy Spirit sovereignly moves on little ones like this, something we used to be so blessed to see happen at unique times when our old friend and mentor Lonnie Frisbee would minister, and so stoked to see it happening in those unique moments when the Holy Spirit just floods into the place as just happened in this service! A man with partially blocked hearing also received some healing. I kept getting a word at the end of the service about something wrong with someone’s ear, my ear kept burning and I wasn’t really sure if it was a word or what, so we awkwardly interrupted as the service was just closing to share the word and no one responded. More awkwardness! Then a lady walked over to her husband and pulled him up to the front; he had damaged his ears with a Q-Tip very badly (careful with those) and his hearing had been all damaged and blocked up for a while. He just couldn’t hear us was why he wasn’t responding when we shared the word. We prayed for him and he said that he felt the blockage beginning to open up, we prayed some more and it continued to get better. Speaking of hearing, our friend Raquel who was at the meeting also, said she had been praying to hear God’s leading, direction and voice better. As we prayed over her she was also touched along with others in a dramatically powerful way! 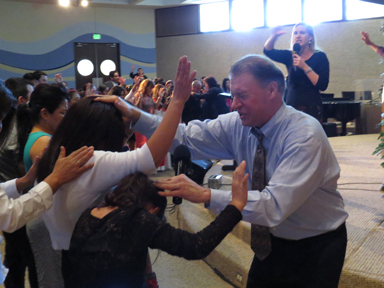 We also just had a radical outpouring of the Holy Spirit up in the Inland Empire. A few different waves of the Spirit had already come over the meeting with great power, releasing the filling of the Holy Spirit and healing as we ministered and prayed for people! Then the pastor asked us to pray for some of the youth. The fire of God came in and just lit up these young people, and some were knocked powerfully to the ground. 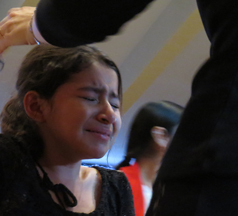 In fact, the pastor’s daughter was so overcome by the presence of God she lay on the ground stuck to the floor even long past the end of the meeting. While the pastor closed the meeting, his daughter laid stuck to the ground by his feet in front of the congregation, while he joked: “Don’t mind my daughter there, she is just really drunk in the Spirit.” Everybody laughed and was overjoyed at the way the Lord had moved. No one minded that the meeting, with all that had happened as God poured out His presence, had stretched way, way, way, beyond the normal time of closing. As we exited, we noticed it was near midnight, quite late for a meeting that started a bit past seven!! The presence of the Lord is so awesome you sometimes just lose track of time! Praise the Lord! Please prayerfully consider supporting us in our upcoming mission trip to Europe. 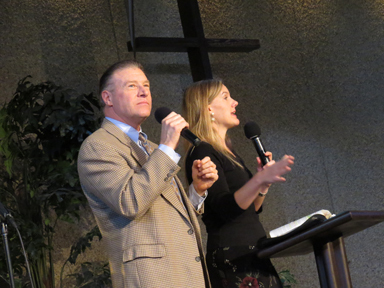 We always appreciate and are so grateful for all your prayers and support of our ministry. Cox South Orange County-Ch. 31-Mon. 5:30p.m. KOCT Ch. 18--Sundays at 7 p.m.